It's happening everywhere! Everywhere that counts! Paris, Milan, NewYork, LA, and London. It's amazing that Kuwait is included in this great event! AlOthman, luxury designer store, and Boutique 4 will be hosting an event, Fashion Night Out, that will start on Thursday September 10th and continue until Sunday, to promote the fashion industry including a sale of their past seasons! AlOthman will be showcasing names such as Balmain, Christian Louboutin, Alexander Wang, and Matthew Williamson while 4 will be providing looks for men and women by different designers such as Rick Owens, Boudicca, Charlotte Olympia, Unconditional and more. 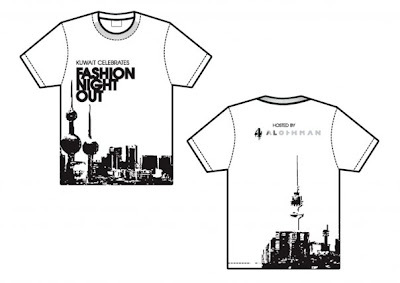 Additionally, together the two boutiques have designed an exclusive limited edition “Kuwait Celebrates Fashion Night Out” t-shirt, which will be on offer for the select few who reach them first.So come join us to celebrate the Wonderful World of Fashion with delicious treats and glorious garments at a steal. Shuwaikh Industrial Area opposite the BMW showroom. Timings: Thursday & Friday from 8pm to 1am. Saturday & Sunday from 11am to 3pm and 8pm to 1am. Oh, and get your souvenir of the event now. A limited edition "Fashion Night Out" t-shirt exclusive at Alothman. All proceedings will be used for a good cause. Ooooh the t-shirt! I want! Wish I could see what they've all got.. but wish I could see NY's fashion night out even more !! looking for. Do you offer guest writers to write content for you? nice operate, and It's going to be a regular visitor for a long time. You must participate in a contest for among the best blogs on the web. this topic therefore I can understand your effort. There is clearly a lot to identify about this. that is great blog. A great read. I'll certainly be back.